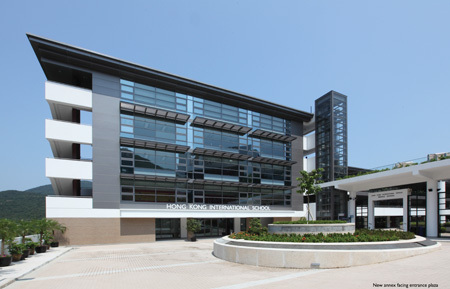 Hong Kong International School, Middle School Annex by Nelson Chen Architects Ltd. Additions and alterations at HKIS have offered a unique opportunity to capture space where land was unavailable for new buildings. Notwithstanding the recent vintage of existing facilities (High School built in 1989; Middle School in 1994), a heritage conservation-like design approach was adopted so that the new additions would blend visually with the original campus outlook. Completed in 2007, rooftop extensions were added to both the High School and Middle School, now enclosed by lightweight metal structures and roofs. The sleek steel-and-glass extensions promoted transparency with minimal visual impact to the scale of existing buildings, which were originally finished in brick tiles and painted concrete. Amidst this context, in 2009, a free-standing addition of 8-storeys was built on a steeply-sloping site adjoining the main entrance circle to the Middle School. This new annex provides additional classrooms and seminar rooms, as well as administrative space for the Head of School, Admissions Office and other departments totalling 37,530 sq.ft. Visually, the new annex seamlessly incorporates the brick-and-concrete base as well as steel-and-glass top of the existing school buildings. Its strategic location enhances main entrance with a more prominent identity and arrival at the Middle School, while enjoying expansive views of the recreation field and foothills to the southwest and sea views to the northeast. 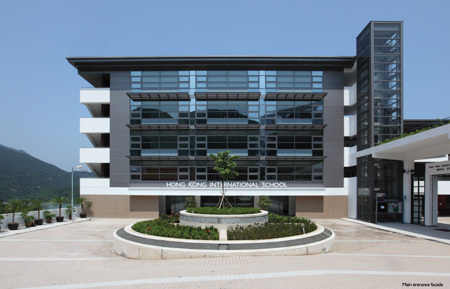 Furthermore, the new annex is the first educational building in Hong Kong to receive a Platinum Award from the HK-BEAM sustainable design rating system, as well as Certificate from the 2010 Hong Kong Quality Building Awards.